Loc Rocker: Nudred: Twists in 2 minutes? Nudred: Twists in 2 minutes? Thanks to reader Rani for putting me on this. Have y'all heard about Nudred? It's this little sponge-y thing that when used on loose natural hair can twist it within seconds. So while it takes a good hour or so to achieve comb coils, Nudred can give you comb coils in 2-3 minutes. I didn't believe it either. Y'all have to check this out. Hit the banner to visit the site. All I can say is "Interestiiiiiing". but I've got a almost free version for you. When I cut down my locks in october I got my stylist to twist my hair : instant comb coils... for real. he gave me a sponge that does the job. Just do it on the surface not through.. and there you'll have the bizz. I am in West Africa and most locs wearer I know used this tool to start ..
the sponge I have is like the square one on the pic. ....You could get those results with a towel. Doesn't mean they're gonna stick. That's mad futuristic, but after looking at some of the comments, you may be able to do this at home without buying this product. It's still super spiff though. i used to do the same thing with my TWA when it was wet, and brown gel. any coily-kinked hair will do this while damp. believe me. i've done it for plenty of my friends. the key to this is texture and damp hair. 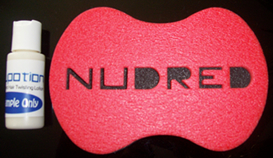 You can also purchase Nudred at www.thesalonconsultants.com Best Price on the Web! ^ But they want $12 + in shipping! Winds up being right about what you'd pay buying it direct. Minus the security!